In this lesson you will learn what views are and how you can create dynamic and generated views. What is a view? And why do we make use of views? A View is a filter on a model which you can use as input for a visualization. 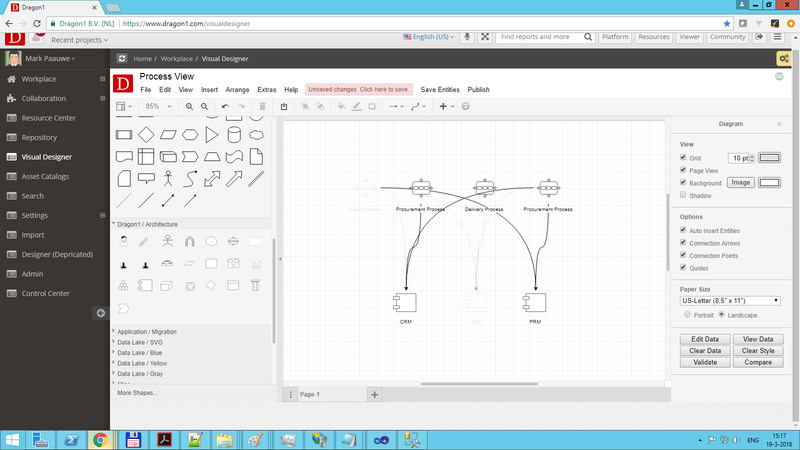 On Dragon1 you have the option to draw static view diagrams like you are used to do in PowerPoint or Visio. You can also create unique generated and dynamic views. In every organization there are a lot of entities. Thousands. And every entity has ten or more data attributes. For consistency reasons you want to create an enterprise model (a single model or a grouped set of models) containing all the entities of the organization. Stakeholders, the people looking at your diagrams, do not always need all available information. They want to focus on certain information and take a decision about it. 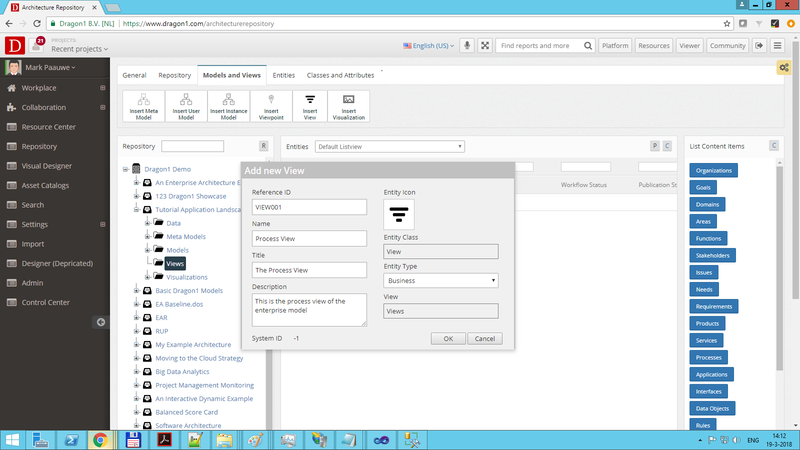 Therefore with views, you have this option to filter out any unnecessary information (attributes values and entities). Suppose you have business processes, software applications and server computers in your organization (every organization has that). These entities are all related to each other. If you have a change in your processes, applications or servers, you don't want to update manually all diagrams that contain the changed, new or deleted entities. 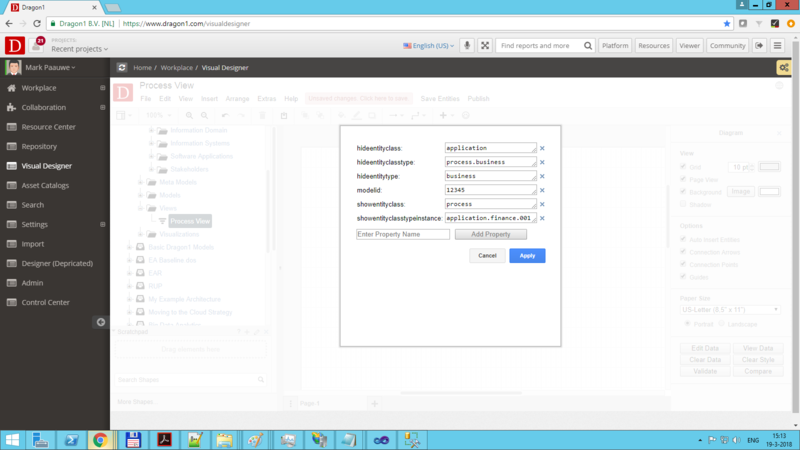 On Dragon1 you basically only have to change the entered entities data. Automatically the models, views and visualizations that make use of that data are updated. And if you do not want that to happen, you can switch off the auto-update feature. 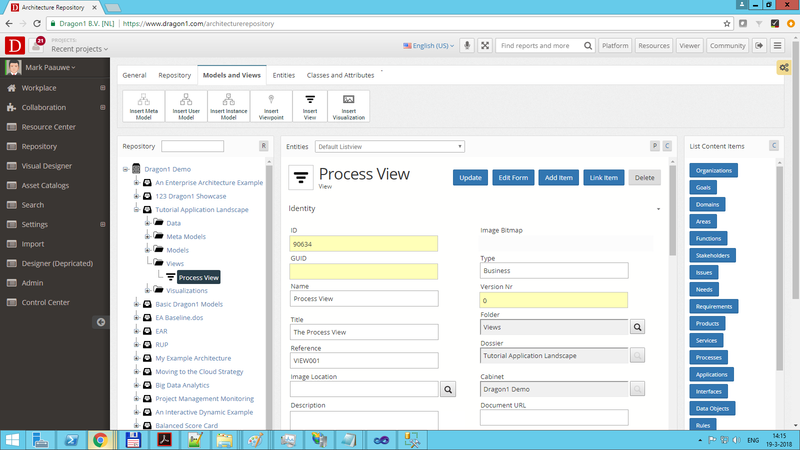 Below is an example enterprise model of processes supported by applications. We are going to create an example view where we filter out certain data from this model. Now you have entered a view. For a View to work you have to set it up. You need at least a model. And you need to configure one or more rules that filter out data from the model. Use opacity with a value between 0 and 100 for the filtered out items. If you setup a view like this you see that it will filter out: nothing or some entities or all entities. This view (filtered model) you can use again as input for a visualization. If you have saved as view and click on the item in the tree, automatically the View Data button will be clicked. To access the view properties, click on Clear Data. 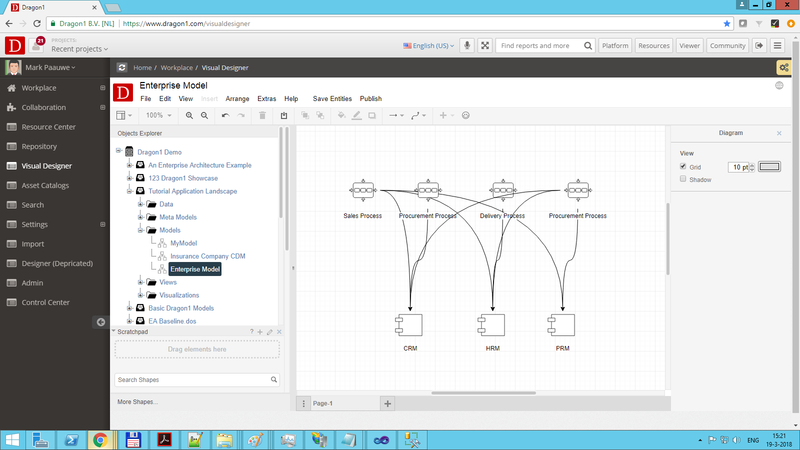 See an example with screenshots of creating a Simple View here. There are many options for the rule event, rule condition and rule actions field in a view. Read all options for views here on this page. A view can be used more than once. You can use and reuse a view as much as you like. You can also combine views into one view or use more than one view in one visualization. If you select the view in the Explorer Treeview, you will see a combined set of view data. You will have noticed that you sometimes have to zoom out and reposition your canvas with the scroll bars in order to see the view data. You can also save that zoom factor and scroll bar position by pressing Save Visualization.